Give your iced tea a kick with these tea-infused cocktails. Enjoy some unique spiked martinis this summer by using tea-infused vodka. To create the infused vodkas, steep tea in vodka in a stainless steel bowl. Place bowl in a pan filled with boiling water and simmer for 7 minutes. Remove from pan and allow vodka to cool. Teas can be purchased from www.teagarden.com. Shake ingredients vigoriously with ice and strain into chilled martini glass. 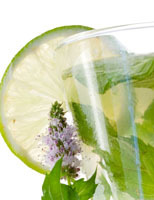 Garnish with lemon wheel and mint sprig. Shake ingredients vigorously with ice and strain into chilled martini glass. Garnish with blueberries and a lemon wheel.